Professional growth happens best when teachers are supported by collegial networks of like-minded professionals. 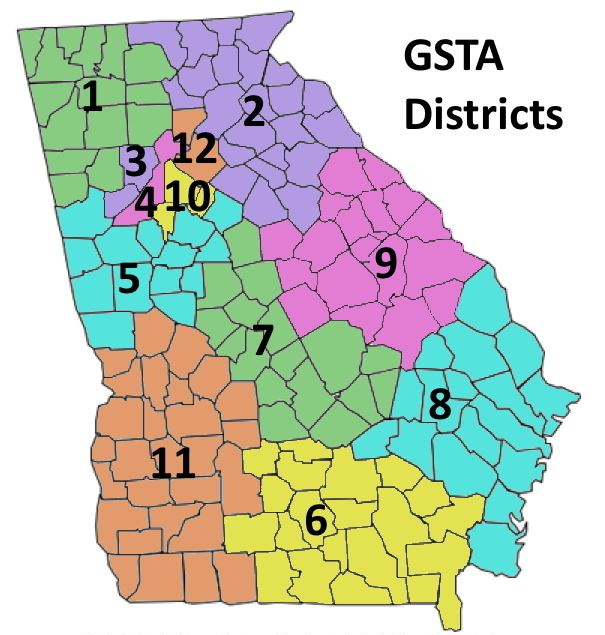 GSTA should provide value to Georgia science teachers and grow the organization’s membership by connecting members to active professional communities within GSTA districts and statewide that build on teachers’ interests, grade-level needs, and content expertise. GSTA professional development will provide members with resources and programs, both in person and through virtual programs, that actively engage all members of the GSTA community in continuous professional growth, designed to increase the success of all students in science. Through an environment of collegiality and collaboration, all GSTA members will have opportunities to increase knowledge, improve performance, and enhance professional satisfaction. In the ever-changing world of science education, it is vital that teachers stay up to date with instructional resources and materials that will enable them to provide the best education to their students. Two key factors make it increasingly difficult for teachers to find and vet resources that are of high quality and appropriate for their students and learning goals. These include a move toward digital resources, which places a greater onus upon teachers to filter through a large number of unvetted resources to make ongoing curriculum decisions. Another factor is that Georgia’s teacher-driven, state-specific standards require great care as teachers adopt and adapt instructional materials designed for other standards. The result is a void of high-quality, vetted resources that support mastery of Georgia’s science standards within the specific contexts of classrooms across our state. GSTA must take the lead in filling the gap by creating, curating, hosting, and disseminating professional resources that meet the particular needs of Georgia’s science teachers and students. While the STEM movement is bringing important attention to science education at all levels, other social and political forces are working to undermine the importance of science and science education in our society. 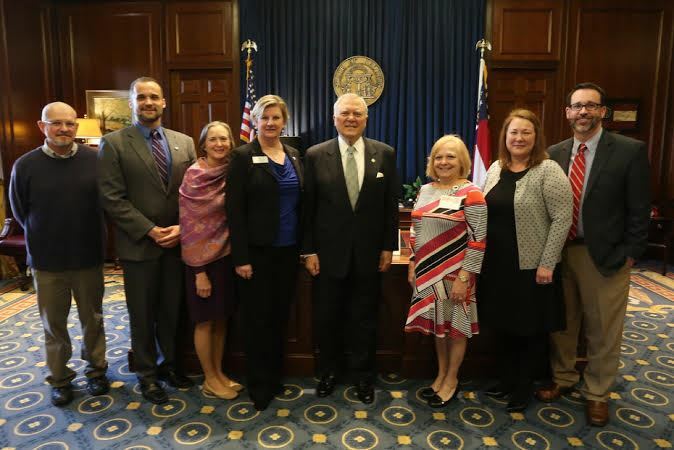 To support excellent science teaching for all students in Georgia, GSTA and our members must advocate for the importance of science, science education, and the science teaching profession at local, state, and national levels. GSTA must work to support the central role of science in STEM education, along with approaches to science curricula, instruction, and assessment that are based on research and best practices and that engage all students, including traditionally underrepresented student populations, in authentic science learning. Participation in science experiences and opportunities in the home and community promotes lifelong learning and a scientifically literate society. Students that come to school with exposure to and acceptance of science concepts through immersion in science experiences at home and in the community are better prepared to learn in the science classroom. Some examples of informal science learning opportunities can include museums, nature centers, science festivals, competitions, camps, science cafes, community science activities and more. Recognize excellence in science teaching through awards and grants. Develop services and resources that meet the unique needs of elementary, middle, and high school science teachers. 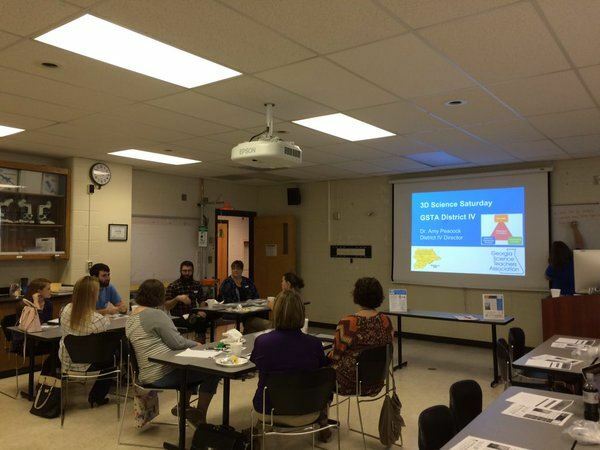 Foster local professional networks through GSTA district events. Facilitate communication and collaboration through special-interest (grade-level, disciplinary, STEM, etc.) 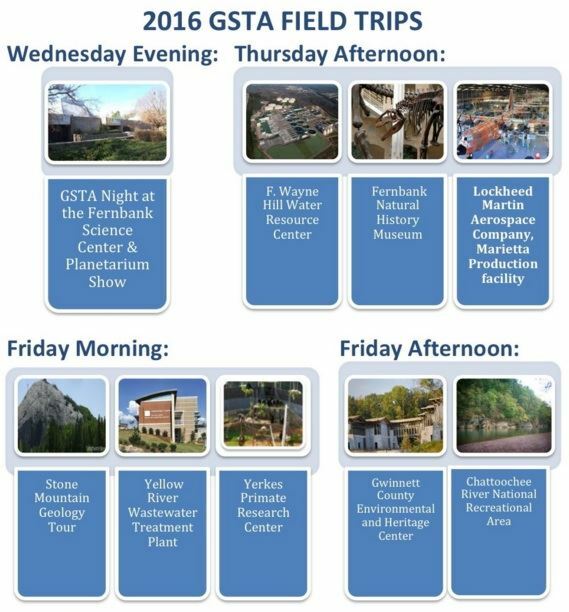 areas on the GSTA website and through targeted events at GSTA’s annual conference. Leverage online social networks to enhance value to members, build awareness of the association, and foster collaboration among GSTA members and their colleagues. Provide the premier science professional learning experience in Georgia through the annual conference. Develop virtual opportunities to extend the reach of the GSTA conference. Increase statewide access to professional learning through face-to-face district events and by increasing the number of those events that include virtual access. Develop GSTA branded professional learning opportunities available online to members. Reimagine GSTA’s website and publications to improve access to and increase awareness of existing resources and content, while engaging more GSTA members with new resources. Leverage the experience and expertise of GSTA leaders and members to create and curate resources that support research-based best practices for science and STEM education. Collaborate with science support organizations (RESAs, GYSTC, NSTA, etc.) to create or disseminate high-quality professional resources. Engage and support GSTA members and other science educators in advocating at the local, state, and national levels. Position GSTA as a resource representing science teachers’ perspectives to relevant state policy makers. Promote a positive image of science, science education, and the science teaching profession among other stakeholders. 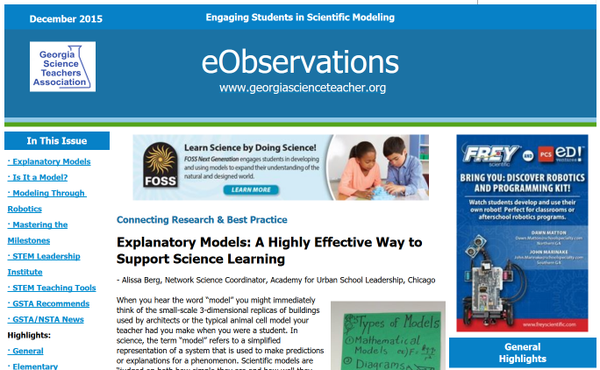 Create and maintain a statewide informal science asset map and database to support teachers in making classroom-to- community learning connections. Seek local and statewide partnerships with informal science education organizations to further GSTA’s mission and goals.